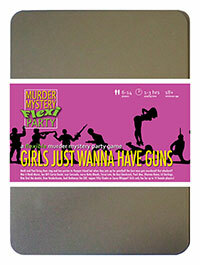 You've been invited to play the role of Bree Vanderhosen in Girls Just Wanna Have Guns. Heidi and Paul are throwing their pre-wedding parties at luxury spa and adventure resort, Pamper Island. But after one too many drinks, the bride and her entourage are invited to 'hunt the stag' with paintball guns - and best man Steve Wingman meets a grisly end! Can you find out who murdered him? Grab your guns and get ready for a facial at the luxury spa and adventure resort of Pamper Island! In tasteful blue or green, your cashmere twinset, matching skirt and heels seem conservative and poorly chosen for a walk in the woods. Things are bubbling underneath though so a hip flask full of alcohol helps you through. When you were young, you dreamed of being the first scientist to find out how to create eternal life. You were halfway there when you met Bryan (pronounced Bwyan) - the love of your life, or so you thought. You gave up your career, the chance of curing ageing - and probably world peace - to be with him, only to later find him playing with the nanny you’d hired to look after the twins. Incensed but dignified, you continued to live a lie while you re-educated yourself in hope of returning to the work you’d once loved - if ever the opportunity presented itself again. I’m so shocked by this ghastly murder! Excuse my manners, Bree Vanderhosen, entrepreneur, publicist, blogger, entertainer and housewife. Steve was such an extraordinary and wonderful soul. He will be sorely missed, I’m sure. I did see him in the woods quite a few times - he always had a flattering remark. “You’ve got a lovely pear.” “I bet you know how to play an organ.” He even asked me to toss his salad for him. Such a nice young man.